1 pattern for the Townswomen’s Guild Kneeler. Pen outline drawing on squared paper backed to card, coloured with coloured pencil. The design shows a circle with flowers and the initials NUTG at the top and TG in the centre. 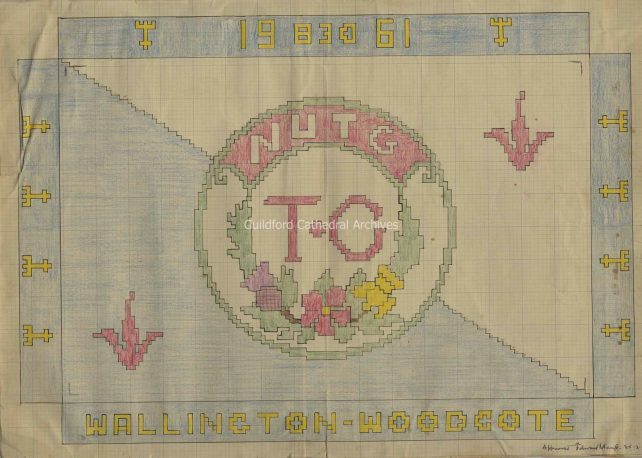 A border with small cathedral plans surrounds the design and the words “Wallington-Woodcote” appear at the bottom and “1961” at the top.